Posted September 17, 2015 at 10:09 pm by M&M Mechanical, Inc. & filed under M&M Mechanical . We’re Experienced. It has been our pleasure to serve our customers in Northern Virginia and the Washington D.C. Metropolitan Area for over 35 years now. As a family-owned business, our customers are our number one priority and we understand how important it is to keep your family happy and safe. We provide ongoing in-house training so that all members of our team will stay current on advancements in technology and equipment and will be able to provide you with the best customer service. We’re Always Available. It’s not something we like to think about, but emergencies do happen. Rest assured that our phones are monitored after hours and you will be able to reach one of our Service Technicians to talk to you and try to help you. We’re Certified. Everyone on our team is factory-trained and NATE-certified. NATE certification ensures that all of our technicians have the knowledge and skills to properly care for all of your HVAC needs. When working with NATE certified technicians, you can rest assured that your HVAC system will be properly installed, thoroughly examined, and perform at maximum efficiency – saving you time and money! We Price Right. At M&M Mechanical, we don’t want you spending more than you have to. We offer free equipment replacement estimates and perform all of our repairs on a flat-rate basis, meaning you’ll know up front what a service will cost. Additionally, we offer financing and a variety of specials to all of our loyal customers. Call us to learn more about our services and what makes M&M Mechanical one of the HVAC industry’s best contractors! Posted September 3, 2015 at 6:43 pm by M&M Mechanical, Inc. & filed under Seasonal Tips . With summer ending in about a month, it’s time to get your HVAC unit to switch gears and prepare for the cooler season. By now, your AC has been running at full capacity for a few months with this hot summer we’ve been having in the area, so these next few weeks are the perfect time to make sure that the summer treated your unit well! Maintenance on your unit ensures that you’re getting the most out of your HVAC system. It’s recommended to get your unit checked out twice a year. Regular maintenance on your unit not only helps improve the quality of the air you breathe, but it will also prolong the life of your unit, which in the end will save you money. Preventative maintenance on your unit will help avoid any problems that could occur during the winter, when you need your heating system most! During our maintenance checkups, we will check the filters and voltage, adjust burners, inspect the condenser coil and much more! To minimize future repair bills, consider a maintenance agreement with M&M Mechanical, Inc. Our trained technicians can provide you with a comprehensive plan to provide preventive and predictive maintenance to help you keep all your HVAC equipment running efficiently. Posted August 13, 2015 at 7:06 pm by M&M Mechanical, Inc. & filed under M&M Mechanical . Posted July 29, 2015 at 6:54 pm by M&M Mechanical, Inc. & filed under Frequently Asked Questions . Why can’t I find the correct size furnace filter at my local home improvement store for my Carrier equipment? Since M&M Mechanical is a Carrier Factory Authorized Dealer, we’re your best resource for supplying the correct parts for your system. What does the warranty cover on my Carrier equipment? 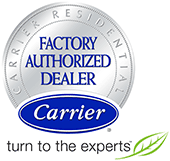 Carrier’s standard factory warranty only covers parts that fail during the warranty period due to a defect in the part. If you can’t find your warranty certificate (which was originally included with your homeowner information packet), we can provide you with your full warranty information. What is the life expectancy of my Carrier unit? There are many variables that affect life expectancy, including the unit installed and the regularity of routine maintenance. Luckily, Carrier products are among the longest lasting heating and cooling products available. If you have further questions, we’d be happy to discuss your specific unit with you – just give us a call! See the full answers to these Carrier-related FAQs, and more, on our FAQs page! Posted July 9, 2015 at 6:39 pm by M&M Mechanical, Inc. & filed under General Tips . This audit is the first step in determining how much and what kind of energy your home uses. The information gathered in an energy audit is used to develop a strategy for steps to take to make your home (or business!) more energy efficient. Tasks covered in an energy audit typically include: checking for leaks; inspecting the furnace, air conditioner and ductwork; examining insulation; examination and recording of walls, ceilings, floors, doors, windows and skylights; and more. The goal is to figure out your home’s overall thermal performance, and, specifically, to identify any areas that are negatively impacting the energy efficiency of your home. Once the energy audit is complete, we can help develop a plan for shoring up any energy weaknesses in the building. This may include things like replacing windows, investing in a new air conditioning unit or furnace, or reinsulating areas of the home. We’ll also let you know if any of the improvements we suggest will qualify for energy efficiency grants or tax rebates. To learn more about how M&M Mechanical can help complete an energy audit of your home, check out the Comfort & Energy Audits page of our website, or just contact us to get your energy audit scheduled!